My post-baby life has revolved around 3 things; taking care of my children, focusing on breastfeeding, and making my own wellness a priority. 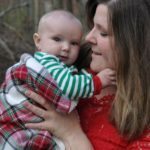 As I have shared a few times, I’m doing things differently this time around postpartum. 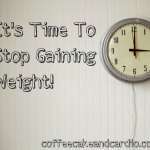 Unlike after my first pregnancy, I just can not focus on weight loss during this season of my life. A time will come when I will make a shift towards getting into better shape, but for now, I know I need to focus on my family, breastfeeding, and wellness. 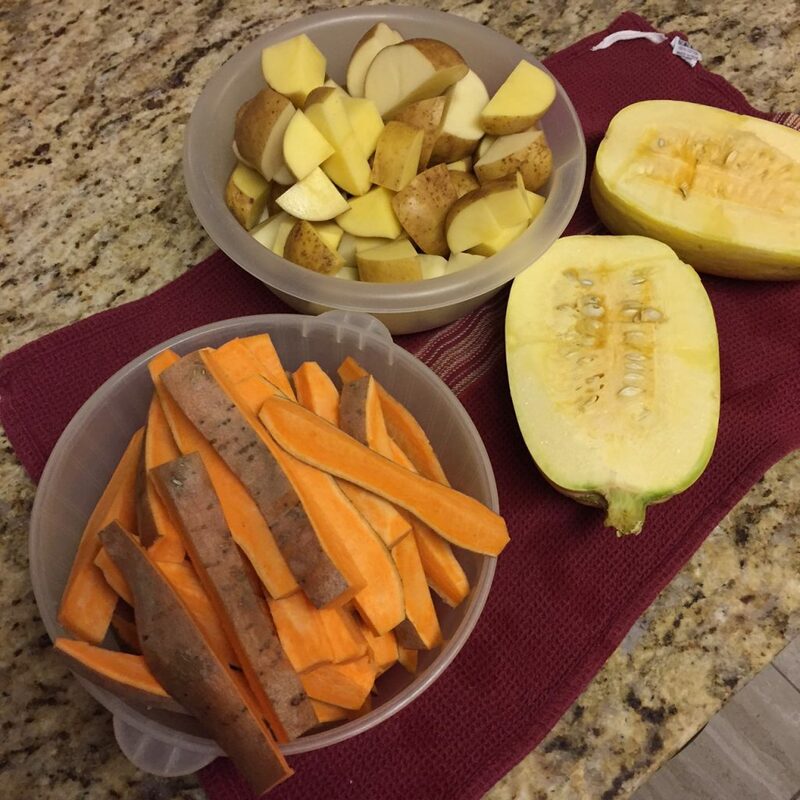 One of Neal’s and my goals, as we look towards our long term health and wellness, is to eat more wholesome foods. It’s really quite amazing to see how far I’ve come over the years. 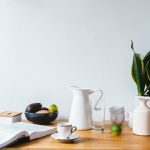 Even just from the start of this blog, I’ve gone from restrictive eating and binge eating, to eating whatever I wanted as I learned moderation (still haven’t mastered), to the place where I am now. I’m in a place now where food is food. I eat what I’m hungry for, try my hardest not to label foods as “good” or “bad”, and don’t get mad at myself for my choices. It’s a pretty freeing place to be at. Having said all this, I do have two realities. Even though I’m not focusing on weight loss right now, as in reaching a lower weight, I’m very eager to reach a place where I’m more comfortable in my body. I am very, very, very proud of the things my body has done over the past 3 years, having 2 kids, but I definitely look forward to feeling comfortable in my skin again. Another reality is that although I’m proud of the freedom I have found with food, not all foods leave me feeling great. Sure, I love a good deli sandwich with a side of chips during the work week, a bowl of ice cream to end the day, or pizza with Neal after a long week, but I won’t deny the difference I feel when I eat less sweets and eat more wholesome foods. 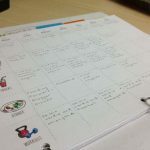 Last month, as Neal and I sat down to finalize our will (totally different topic), it got us thinking about our future, our health, and our long term goals. We both want to live long and healthy lives and thought through the changes we could make now that would impact our lives further down the road. We’ve honestly wanted to do this for a long time, making healthier choices more often then not, but it takes effort to eat fresh, wholesome, and non-processed foods. Effort equals time, and I’ll be the first to admit that our time is stretched pretty thin right now with an almost 3 year old, a newborn, and 2 full-time careers. 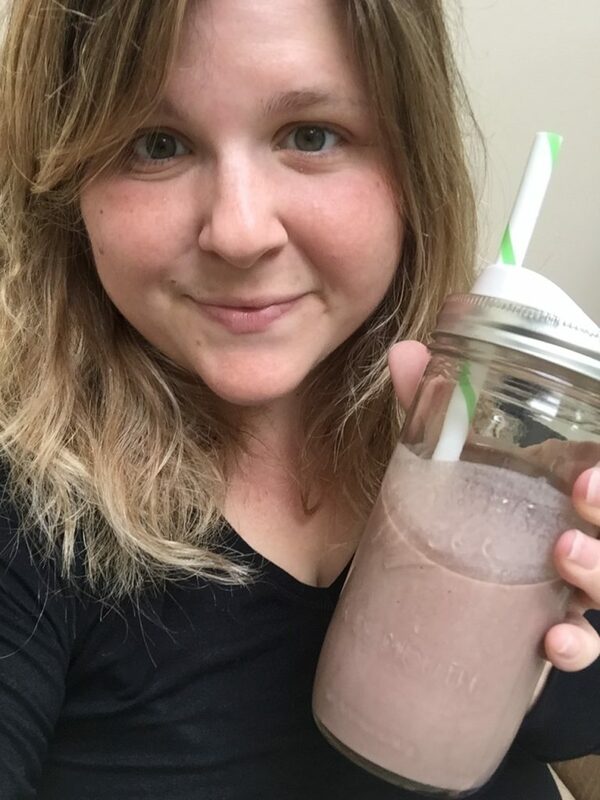 With one of my main focuses postpartum being my own wellness, Neal and I decided to make a conscious effort for the next two months to eat better! We’re well into our third week and I have to tell you, I’m feeling really great!! Although I’m sleep deprived, thanks to my 8 week old, I have a lot more energy and just feel healthier. 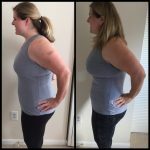 This effort has absolutely nothing to do with weight loss and has everything to do with fueling our bodies differently. We aren’t counting calories, we aren’t measuring serving sizes, and we aren’t focused on the number on the scale. Heck, I don’t even know the number on my scale. We’re simply changing what we’re putting in our bodies. So, what have Neal and I been doing to clean up our diet? Well, we’re making a conscious effort to eat little to no processed foods. I’ll explain where the “little” comes into play for me personally in a bit. We are focusing on whole grains, protein, certain dairy products, fruits, and veggies. We aren’t being restrictive, but we are trying to have the majority of what we eat fall into these categories. The way it has played out is that we’re both eating different things for breakfast each day, but then we’re both eating the exact same lunches and dinners Monday through Friday. The past few weeks, I’ve prepared our lunches and dinners for the entire work week on Sunday. This has been great, not only for our diets, but also for our transition to having two kiddos and taking care of ourselves. It’s so nice not having to think about what we’re going to eat, both at work and at the end of the day. On the weekends, we have a bit more flexibility to make different meals and to cook more, as we have the time. We’re both staying away from breads, sweets, and cheese, not because we “can’t” have them, but because we don’t feel great when they make up the bulk of our diet. Let me tell y’all, I could eat some form of bread, with cheese, at every single meal! Cheese in my eggs with toast for breakfast, a sandwich with cheese for lunch, and a quesadilla for dinner… you get the idea. We also LOVE sweets! We love ice cream, cookies, and treats and we’re just trying to reign it all in. The one thing we are doing, which I love both for our health and our financial wellness, is we’re enjoying one meal a weekend out of the town. It’s so nice going out to eat with Neal, but limiting it to once a week both as we fuel our bodies differently and watch what we’re spending. Last weekend we went out for burgers and milkshakes, which was exactly what we were craving after the work week. It was awesome! This weekend, I think Mexican food is in our future! I have oatmeal with peanut butter and fruit every morning for breakfast. This is to support lactation, but I love having oatmeal. 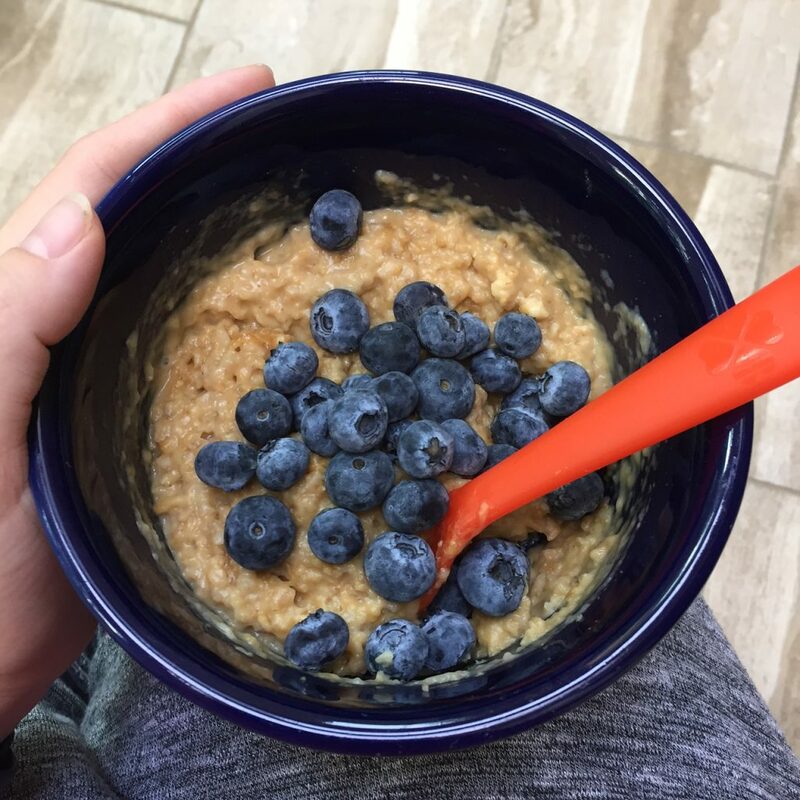 You can see how I make my oatmeal on this blog post. For lunch last week, we had brown rice, veggies, and slow cooker salsa chicken. 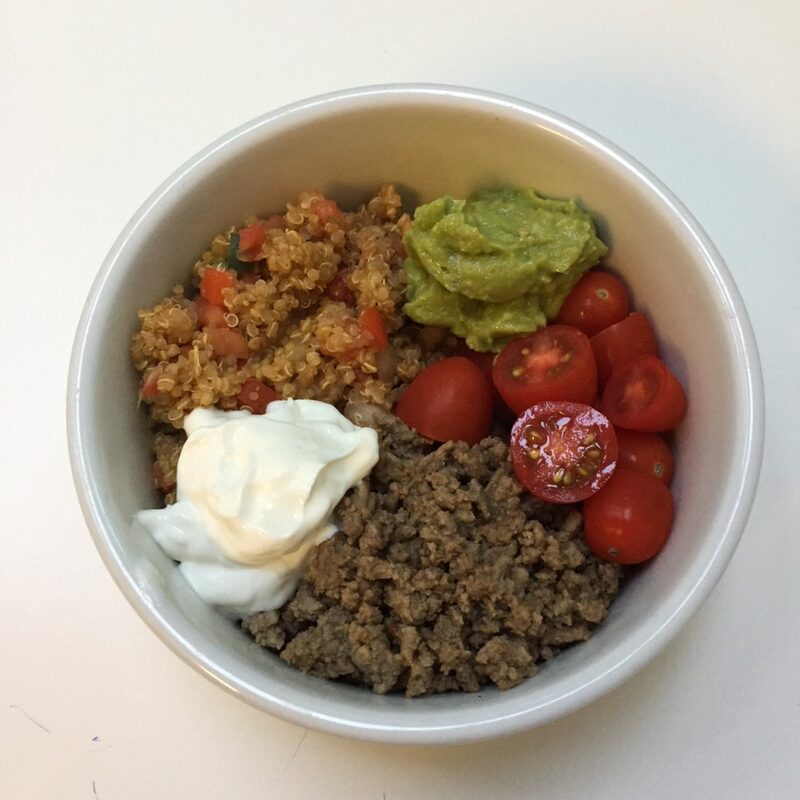 This week we’re having Mexican Quinoa taco bowls, which are delicious! Last weekend we made steak tacos on corn tortillas, which was a nice change up from our consistent lunches last Monday-Friday. For dinner last week, we had roasted potatoes, zucchini, and turkey burgers. 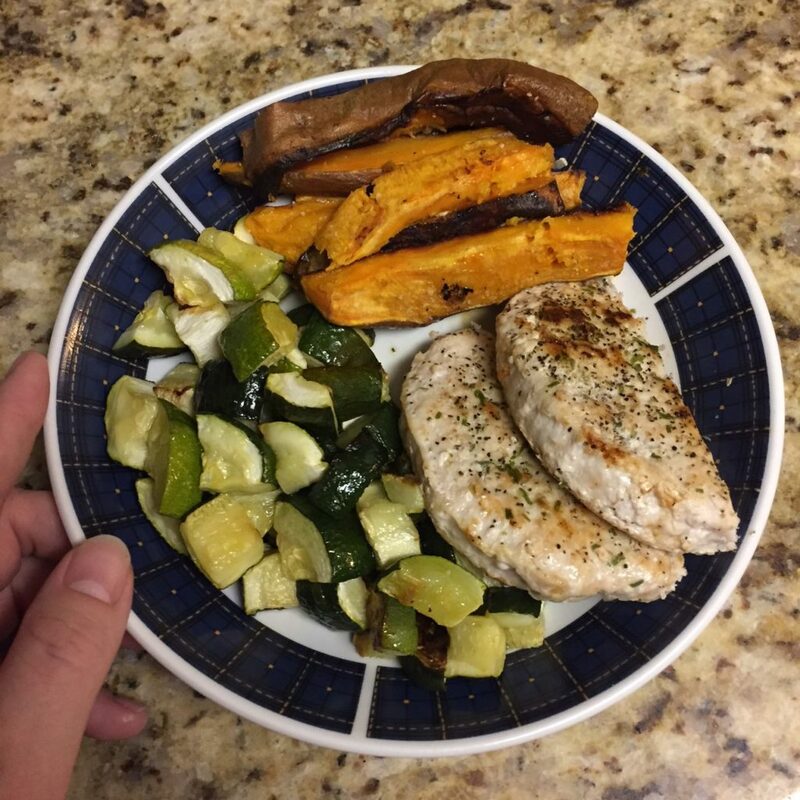 This week we’re having roasted potatoes, zucchini, and chicken burgers. (We like our burgers!). Where my “little to no processed foods” comes into play is with snacks. I have to snack while breastfeeding. I see a major tank in my supply when I don’t drink enough water and eat enough food (shocker). My snacks most days include a protein shake, triple zero yogurt, Bevita biscuits (so good! ), piece of fruit, hard boiled eggs, and/or tuna. Oh, and I have one GLORIOUS cup of coffee each morning with some sweet and delicious creamer. I feel so much better when I limit the amount of breads, cheeses, and sweets I eat, especially when I replace them with wholesome foods. The only reason I don’t feel like I’m restricting myself is because I’m not. We’re still “allowing” ourselves to eat any and all foods, we’re just limiting the ones that don’t leave us feeling like our best selves. All in all, I’m really grateful to be working on this clean up in partnership with Neal. It’s not the easiest adjustment with a newborn, because trust me, I’d love to just order dinner in every single night, but we feel a lot better eating this way. It has only been a few weeks, but I hope we’re creating better habits for ourselves and in return for our family. It’s nice creating moderation from an angle that doesn’t involve serving sizes and it doesn’t really matter what the scale says. I’m feeling great and I’m proud of us.